Objective: To assess the birth prevalence and pattern of congenital heart disease (CHD) using echocardiography in babies born in a community hospital of North India. Methods: A cross-sectional observational study conducted over a period of 3 years. Newborns born over a specific 8-h period of the day were recruited in the study. They underwent routine clinical examination and pulse oximetry, followed by screening echocardiography for diagnosing a CHD. 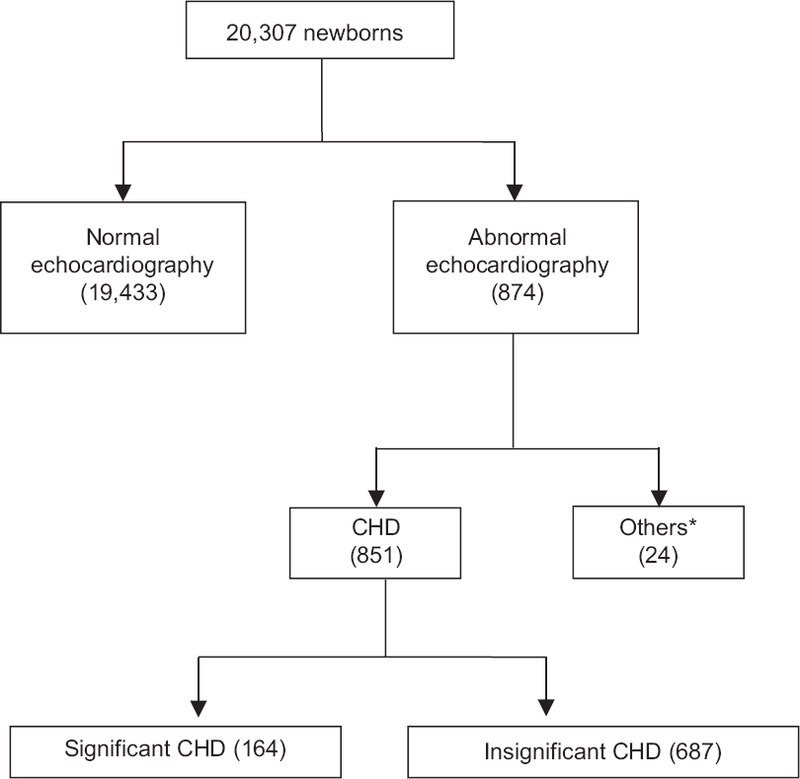 Results: A total of 20,307 newborns were screened, among which 874 had abnormal echocardiograms; 687 had insignificant CHDs, 164 had significant CHDs, and 24 had other abnormal cardiac findings. The birth prevalence of significant CHDs was 8.07 per 1000 live births; 131 newborns had an acyanotic CHD (79.9%) and 33 a cyanotic CHD (20.1%). Ventricular septal defect (VSD) was the most common acyanotic CHD, present in 116 newborns, giving a prevalence of 5.7/1000 live births. Among the cyanotic CHD, transposition of great arteries was most common (prevalence 0.34/1000 live births). Conclusion: The CHD birth prevalence in our study is similar to the reported worldwide birth prevalence. Acyanotic CHD (mostly VSD) is seen in about three-fourths of babies born with CHD. The more sinister cyanotic CHD is present in remaining 25%. Objective: To determine the delay in diagnosis of various types of congenital heart defects in children and factors associated with such delay. 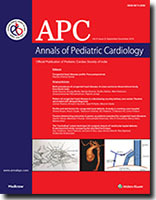 Patients and Methods: For this observational study, 354 patients having congenital heart disease (CHD) presenting for the first time to the Department of Cardiology, Children's Hospital, Lahore, Pakistan, between January 1, 2015 and June 30, 2015, were enrolled after obtaining informed verbal consent from the guardian of each child. Demographical profile and various factors under observation were recorded. Results: Among the 354 enrolled children (M: F 1.7:1) with age ranging from 1 to 176 months (median 24 months), 301 (85.1%) had delayed diagnosis of CHD (mainly acyanotic 65.3%), with median delay (8 months). Main factors for delay were delayed first consultation to a doctor (37.2%) and delayed diagnosis by a health professional (22.5%). Other factors included delayed referral to a tertiary care hospital (13.3%), social taboos (13.0%), and financial constraints (12.3%). Most children were delivered outside hospital settings (88.7%). Children with siblings less than two (40%) were less delayed than those having two or more siblings (60%, P < 0.001). Conclusion: Diagnosis of congenital heart defect was delayed in majority of patients. Multiple factors such as lack of adequately trained health system and socioeconomic constraints were responsible for the delay. There is a need to develop an efficient referral system and improve public awareness in developing countries for early diagnosis and management of such children. Introduction: Congenital heart defects (CHDs) are an important cause of mortality and morbidity in children representing a major global health burden. It is thus important to determine their prevalence and spectrum and identify risk factors associated with the development of heart defects. Materials and Methods: A case-control study was carried out in the Department of Pediatrics and Center of Cardiology, Jawaharlal Nehru Medical College, Aligarh Muslim University, Aligarh, Uttar Pradesh, India, from February 2014 to August 2015. All patients referred with complaints or clinical examination suggestive of CHDs were further evaluated with echocardiography. On Echocardiography, patients having CHDs were included as cases and those having a normal echocardiographic study were included as controls. Healthy controls were also included. 400 cases and 400 controls were thus identified; preterms having patent ductus arteriosus and patent foramen ovale and those with acquired heart defects were excluded. Risk factors among cases and controls were further studied. Results: Acyanotic heart defects were 290 (72.50%) of the total heart defects, whereas the contribution of cyanotic heart defects was 110 (27.50%). Out of all CHDs, ventricular septal defect was the most common lesion with contribution of 152 (38%) cases, whereas among the cyanotic heart defects, Tetralogy of Fallot was the most common lesion (18% of total cases). Out of the total 400 cases, 261 were males (65.25%). On univariate analysis, paternal age (odds ratio, OR, 2.01), bad obstetric history (OR, 2.65), antenatal febrile illness (OR, 4.12), and advanced maternal age (OR, 3.28) were found to increase the risk of CHD whereas intake of multivitamin (OR, 3.02) was found to be protective. The risk factors were further analyzed with multivariate logistic regression analysis and all the above factors were found to be significantly associated. Conclusion: We noted that the profile of CHD in our population was similar to the published literature although many were missed during infancy and detected later in life. Several antenatal factors were found to be associated with the incidence of congenital heart disease emphasizing the need to prioritize antenatal care and counseling to pregnant mothers along with good maternal nutrition and folic acid supplementation. Background: The number of grown ups with congenital heart diseases (GUCHs) is steadily increasing. Aims: To analyze factors predicting early cardiac morbidity following cardiac surgery in GUCH at a tertiary care center. Setting and Design: Retrospective study at a multispeciality tertiary referral center. Methods: Between January 2004 and December 2014, 1432 patients ≥13 years of age (acyanotic defects: 843, cyanotic defects: 589) underwent surgery for congenital heart defects. Factors associated with early cardiac morbidity were analyzed. Statistical Analysis: Univariable and multivariable analysis of all factors affecting outcomes. Results: On multivariate analysis, previous sternotomy, aortic cross-clamp time. >45 min, cyanosis, and emergency procedure were independent predictors of early morbidity with respective odds ratios. (ORs) of 12.4, 3.6, 2.6, and 8.1. For more precise estimation, a risk score was generated. Taking the log odds with each of these four as respective weights, a score was generated. The variables were. previous sternotomy. (2.5), aortic cross.clamp. >45 min. (1.3), emergency procedure. (2.1), and cyanosis. (0.9), if the respective condition is present, zero otherwise. The score ranged from 0 to 4.5. The average value of the score based on the four variables was significantly higher in cases with morbidity. (1.85. ± 1.17) vs. (0.75. ± 0.88), P < 0.001. Distribution of scores was significantly different between patients with and without morbidity. Sixty-seven percent patients without any morbidity had score. <1 compared to 24.6% with morbidity. 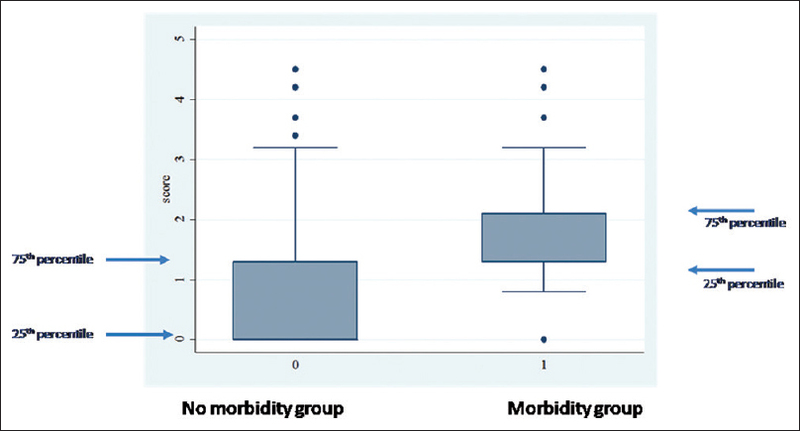 Only 0.9% patients without morbidity had score of ≥3 compared to 16.4% patients with morbidity. Compared with patients having score. <1, patients with scores 1-2 had OR of 3.4, 2.3 had OR of 6.0, and. >3 had OR of 48.7. Conclusion: GUCH can be safely operated when adequate caution is taken in the presence of independent predictors such as previous sternotomy, aortic clamp time >45 min, cyanosis, and emergency procedure. Background: Conventional methods of closure of ventricular septal defects involve placement of sutures 4-5 mm from the posterior inferior margin. This study compares the conventional method with an alternative technique wherein sutures are placed along the edge of the defect thereby “excluding” the conduction system and the tensor apparatus of the tricuspid valve from the suture line. 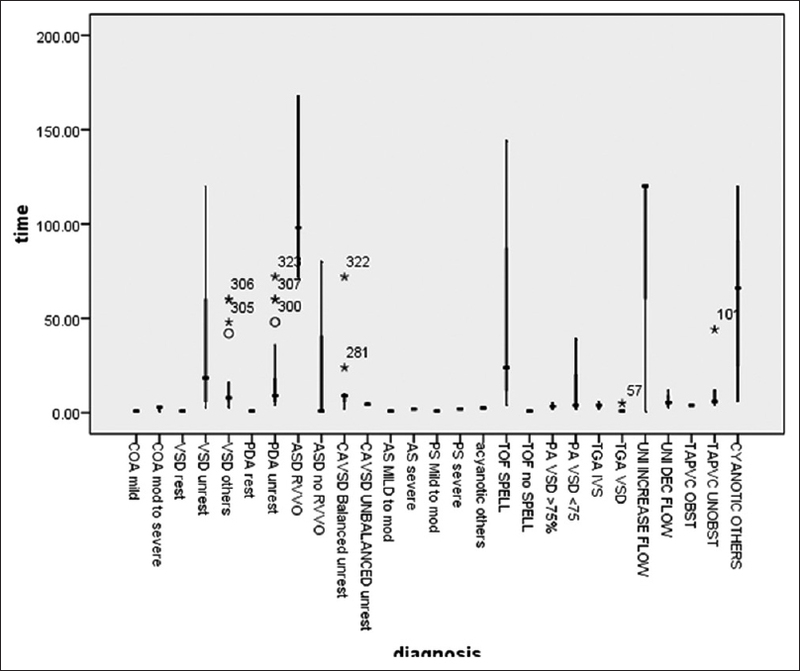 Materials and Methods: Between January 2013 and January 2016, 409 consecutive patients were retrospectively reviewed and divided into two matched groups. Group A (n = 174) underwent closure using the alternative technique and Group B (n = 235) with the conventional technique. Patients with isolated ventricular septal defects (VSDs) (n = 136) were separately analyzed as were infants within this subset. Results: Immediate postoperative results were similar with no statistically significant differences in either group in terms of incidence of residual defects or postoperative tricuspid regurgitation. There was however a significantly increased incidence of post operative complete heart block (CHB) among patients in the conventional group (P = 0.02). Incidence of temporary heart block that reverted to sinus rhythm was also more in the conventional method group (Group B) (P = 0.03) as was right bundle branch block (P ≤ 0.05) in all the subsets of patients analyzed. Conclusion: Surgical closure of VSDs can be accomplished by placing sutures along the margins or away with comparable results. The incidence of CHB, however, seems to be less when the “excluding” technique is employed. This review attempts to answer the common questions faced by a clinician regarding thromboembolism and thromboprophylaxis in patients following Fontan surgery. The review is in an easy to understand question and answer format and discusses the currently available literature on the subject in an attempt to arrive at practical clinically relevant solutions. Patients who have undergone the Fontan operation are at a high risk for thromboembolism. Based on available evidence, there is a strong rationale for thromboprophylaxis. However, it is not clear as to which agent should be administered to prevent thromboembolic events. While the available evidence suggests that antiplatelet agents alone may be as good as oral anticoagulants, there is a need for a large multicenter randomized control trial comparing these two common strategies to deliver a clear verdict. 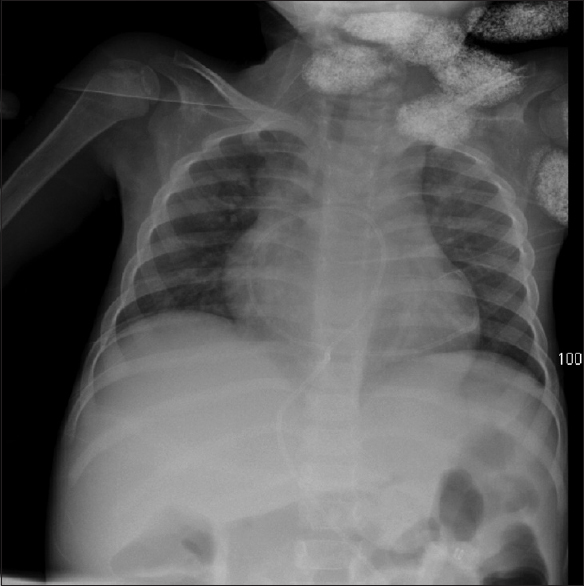 Cardiac tamponade is a rare but serious emergency condition in the pediatric population. As treatment, a pericardial drain is often placed to evacuate the fluid. 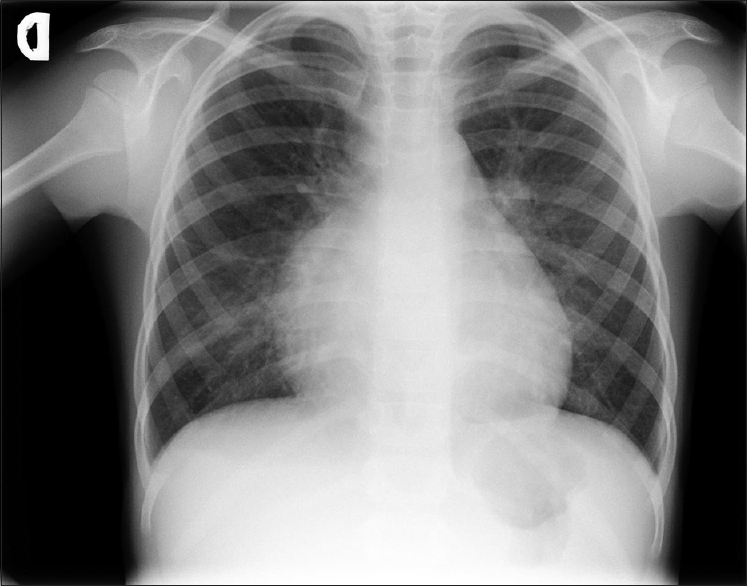 We present a case of a 4-year-old girl with cardiac tamponade secondary to renal failure. After the tamponade resolved, she suffered cardiovascular collapse upon attempted drain withdrawal. 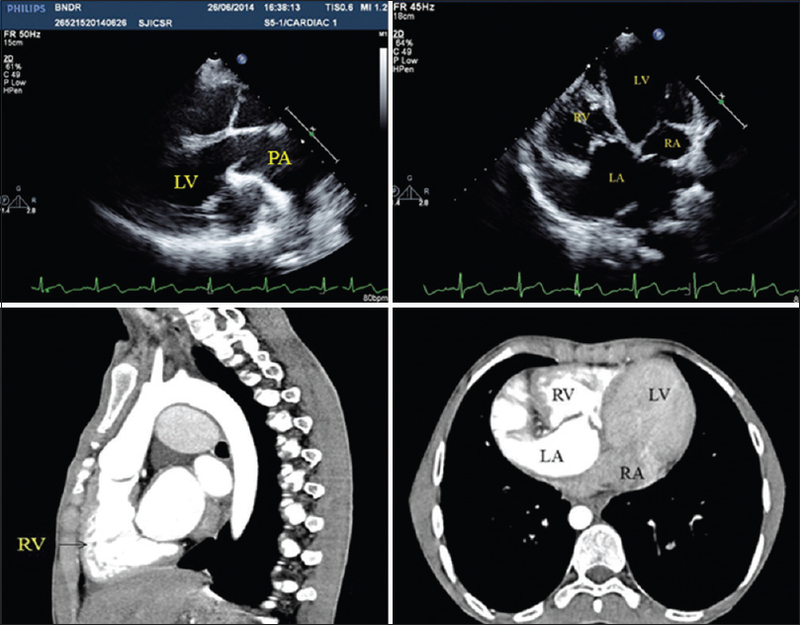 This case highlights an unusual cause for cardiovascular collapse, which occurred on blind removal of a pericardial drain. Aneurysms of ascending aorta are rarely seen in pediatric age group. Only few cases with Marfans syndrome have been reported in the literature. Preferred treatment for these children has been the standard Bentall procedure (aortic root replacement with composite graft prosthesis). We report a 4-year-old male child with huge aneurysm of ascending aorta and aortic root dilation with severe aortic regurgitation, having phenotypic features of Loeys-Dietz syndrome type I. He underwent Bentall procedure with a novel modification (medial trap-door technique for coronary reimplantation). Short-term result of this procedure is encouraging and he is asymptomatic for the last 14 months of follow-up. 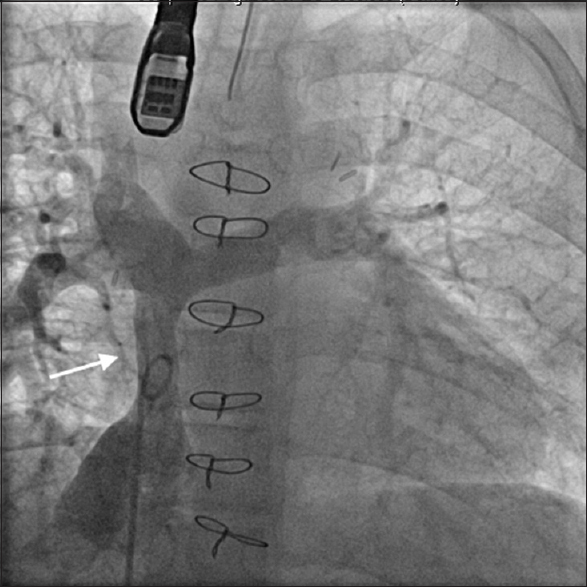 In this report, we describe a 15-year-old patient who underwent a Ross procedure for a regurgitant bicuspid aortic valve and ascending aortic dilation. After the operation was over, he could not be separated from cardiopulmonary bypass and was noted to have isolated right ventricular failure. This report takes the reader through the diagnostic evaluation, highlights the importance of invasive assessment in the immediate postoperative period, and discusses successful transcatheter intervention in the acute postoperative setting. 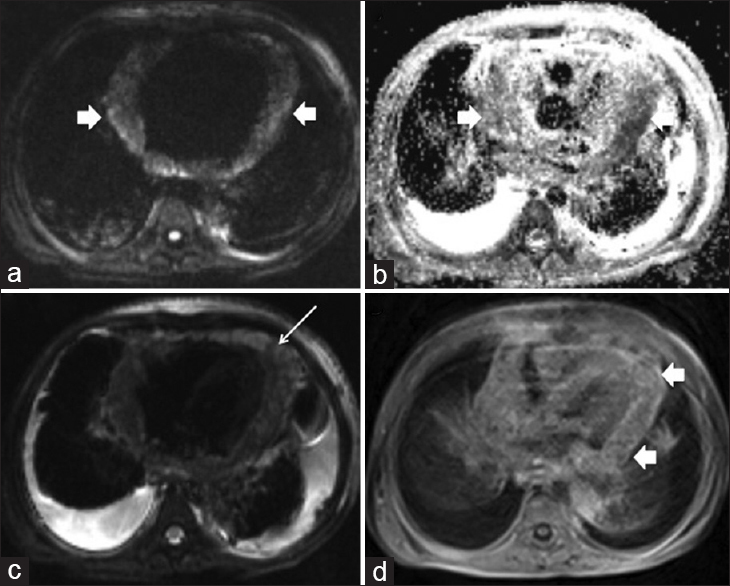 A 44-year-old woman presented with features of congestive heart failure. Echocardiography revealed severe right ventricular dysfunction along with passive minimally pulsatile pulmonary blood flow suggesting very high systemic venous pressures. This was confirmed with cardiac catheterization in which the pressures of superior vena cava and inferior vena cava (19 mmHg) were higher than the pulmonary artery pressures (17 mmHg). Elevation of systemic venous pressures above the pulmonary venous pressures, Fontan paradox, to drive the forward flow, is a specific feature of artificially created cavopulmonary shunts. 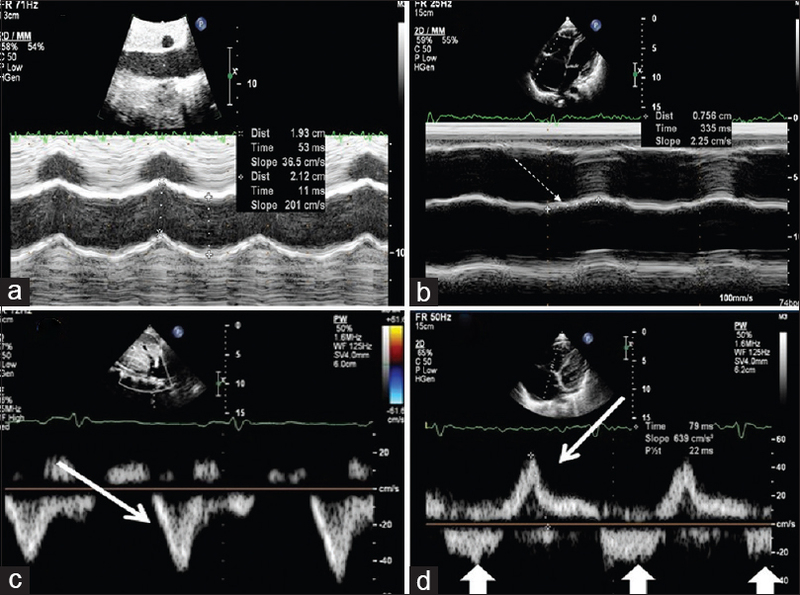 Late stage of isolated right ventricular cardiomyopathy resulted in the spontaneous evolution of Fontan circulation with a nonfunctional right ventricle in this patient. 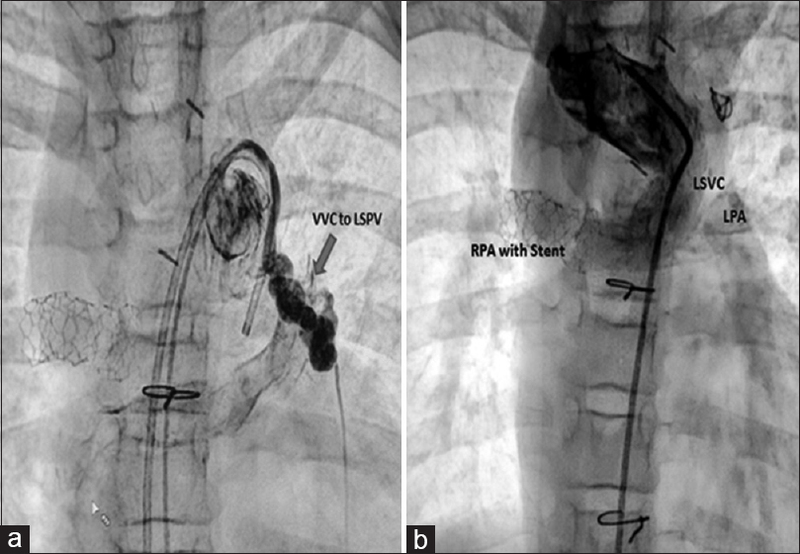 Fontan completion after prior Kawashima repair for single ventricle with interruption of the inferior vena cava can be accomplished by various methods. 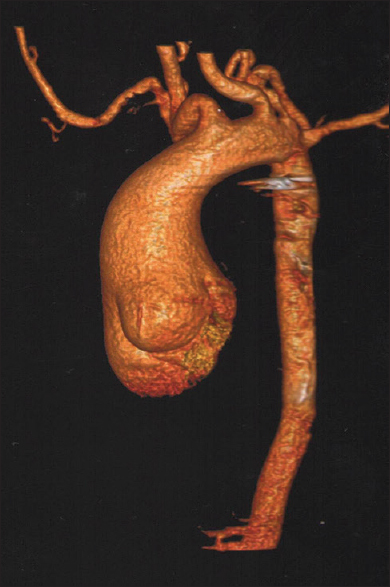 We describe a patient who underwent the connection of hepatic to hemiazygos vein that we believe would be superior to the conventional cavopulmonary connection in our patient. Failing Fontan physiology in univentricular hearts manifest with protein-losing enteropathy, plastic bronchitis, low cardiac output, and recurrent effusions. Transcatheter creation of fenestration in a failing Fontan may be useful in alleviating the symptoms by improving the cardiac output. It is traditionally achieved by puncturing through the conduit from femoral or jugular venous access. In the absence of good venous path, transhepatic access provides a direct route for needle puncture of the conduit. If marked intimal ingrowth into the conduit results in increasing rigidity and makes the conduit nonyielding, alternative approaches may be needed. 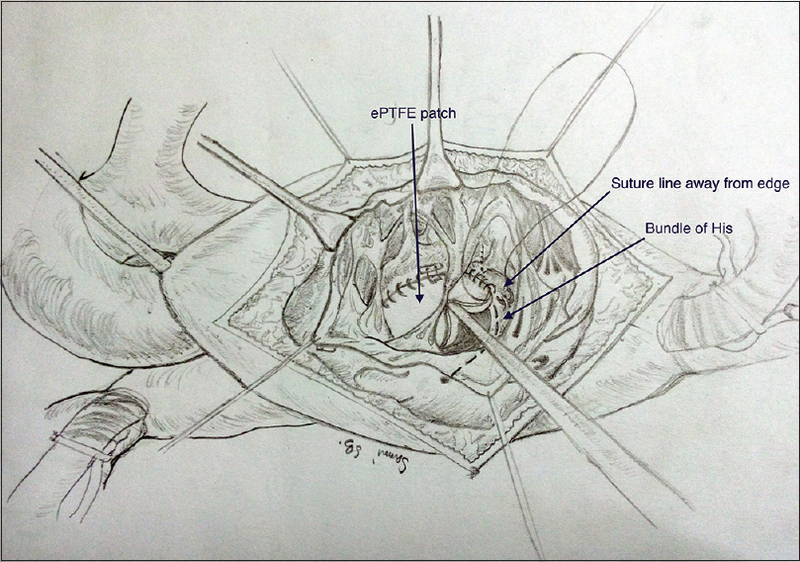 A successful creation of pulmonary artery to atrial roof communication through the potential space of transverse sinus using a covered stent is presented. 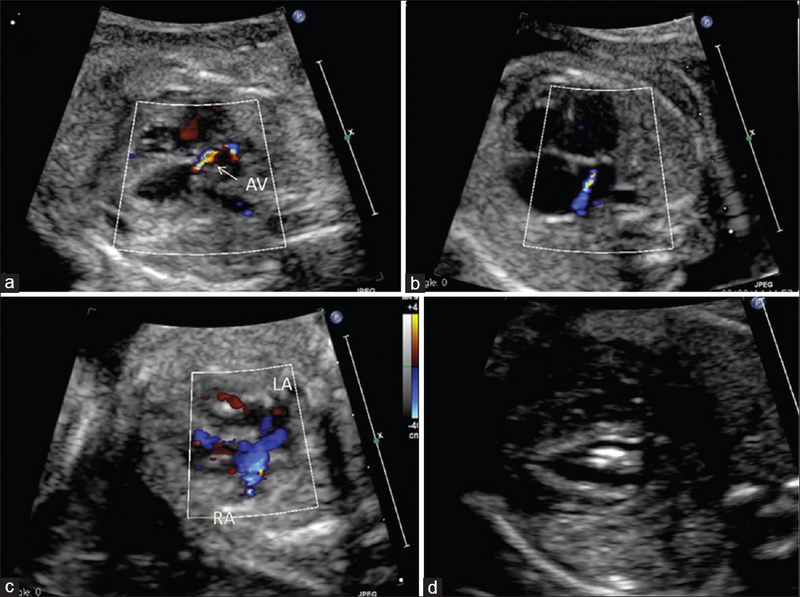 We present a diagnosis of isolated anatomically corrected malposed great arteries on fetal echocardiography at 31 weeks of gestation period. The patient was referred to our institute with a diagnosis of suspected transposition of great arteries.